Established as a partnership in 1866 by H. H. Abbe, E. C. Barton, E. G. Cone and A. H. Conklin The Gong Bell Manufacturing Company began producing bells and toys in the Town of East Hampton, Connecticut. Today The Gong Bell Mfg antique toys and bells are sought after by collectors around the world as the company was not in existence past the 1960s. 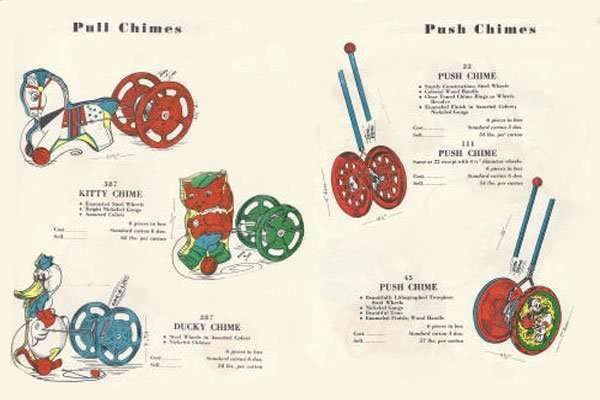 In 1872, Barton patented a toy called “Revolving Chimes” described as “a pair of cast brass gongs, mounted between two malleable iron wheels.” This was the beginning of Gong Bell’s toy making history. 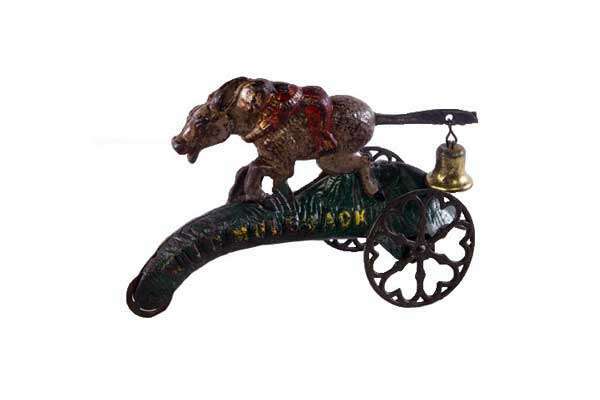 The company also manufactured the first foot bell ever used on automobiles. 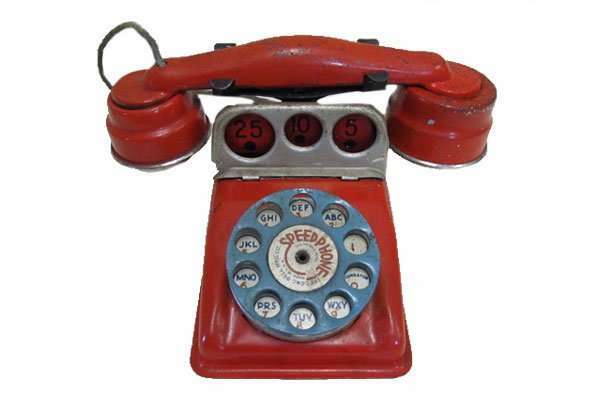 In 1921 Gong Bell Manufacturing introduced a Toy Telephone featuring a bell and movable receiver hook. 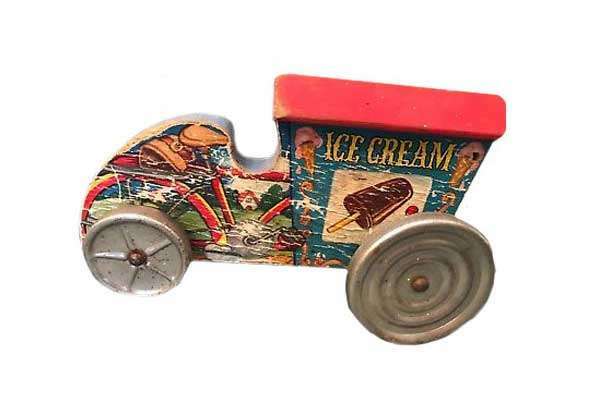 This was also the time the Bell Factory started concentrating on its wooden toy future. During World War II, Gong Bell also took on military contracts to make hardware for parachutes. It is believed that with the introduction of plastics in toy making, the Gong Bell Co. could not complete since their toys were made mostly of wood and metal, thus closing the company in the 60’s. There are few collectors of Gong Bell made toys. 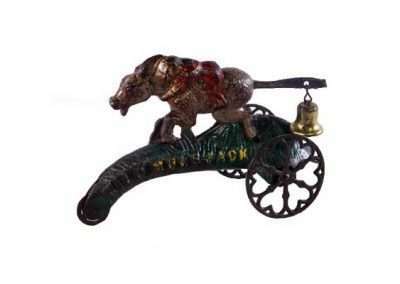 Most collectors who have Gong Bell antique toys in their collection have them because they fit into their category of interest. Also known as “Belltown U.S.A.”, The Town of East Hampton Connecticut was once dominated by bell manufacturers for much of its history. This began with the arrival of William Barton in 1808 and continued throughout the 19th and early 20th centuries as workers trained in Barton’s mill established their own shops, many of these located along Lake Pocotopaug Creek in the center of town. 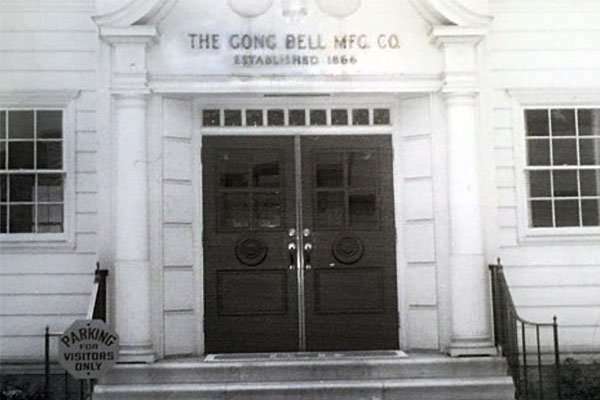 The organization of the Gong Bell Manufacturing Company was typical of this experience, as its founders, H.H. Abbe, E.C. Barton, E.G. Cone, and A. H. Conklin, all had connections to East Hampton’s early bell manufactories before establishing their own firm in 1866. The Gong Bell Manufacturing Company initially occupied a plant on the site that would become the Summit Thread Company on Summit Street and produced various lines of door and house bells, alarm bells for locomotives and street cars, and hand and sleigh bells. By the mid-1870s, the company had relocated to a mill at the corner of what are today Walnut Avenue and Watrous Street, which it shared with the firm of Goff and Abell (later the East Hampton Bell Company, since demolished). In 1872, E.C. Barton developed and patented the “Revolving Chimes,” a toy bell consisting of a pair of cast brass gongs mounted between two malleable iron wheels. This developed into a full line of bell-based toys that would become the primary focus of the company for the rest of its existence. In 1912, the company was reorganized under Mayo S. Purple, president; Chauncey G. Bevin, vice-president; J. Howell Conklin, secretary; and Clifford M. Watrous, assistant secretary, treasurer, and general manager; and Harold D. Allen, factory manager; and George T. Cavanaugh, superintendant. These officers oversaw the construction of a new, 152’ x 40’ plant on the south side of Walnut Avenue after a fire destroyed the company’s press room and assembling department on January 1, 1916. 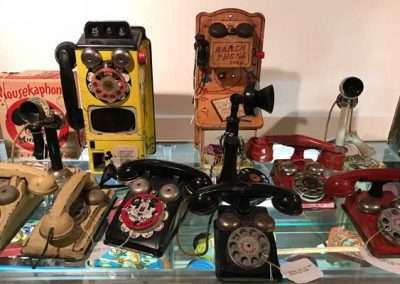 The Gong Bell Manufacturing Company continued to thrive through the 1920s, 1930s, and 1940s, largely driven by its extensive line of wood and metal toys, many of these based on a toy telephone invented by Watrous in 1921. 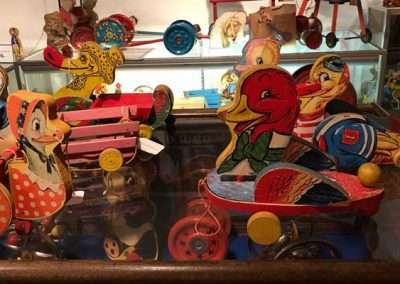 The company’s production peaked in the early 1950s, a time in which its over 175 employees were turning out 2,250,000 toys per year. This success came to an end in 1960 when financial difficulties – attributed to failure to adopt the use of plastics – forced the company to close its doors. On December 20, 1973 a massive fire tore through the company’s former plant, destroying a roughly 200’ x 200’ section at its core. Several light industrial firms occupying the building were impacted, however, the northeastern and southeastern wings of the factory – the former being the plant’s original manufacturing block – were saved and continue to stand. The former Gong Bell Manufacturing Company plant is consists of two clusters of adjoining blocks located on the south side of Walnut Avenue and the east side of Main Street. These two groups of manufacturing and storage buildings were once connected, thus forming a rougly L-shaped footprint, however the core of the plant was destroyed by fire in 1973. The earliest surviving block is original to the mill and is located along Walnut Avenue. Built in 1916, it consists of a one-story, 152’ x 40’ frame structure with red brick foundation, synthetic siding, flat roof, and numerous pyramidal skylights. The building straddles Lake Pocotopaug Creek and its end walls (east and west elevations) consist of red brick firewalls with stepped parapets. Numerous one-story additions were erected on the south (rear) side of the block during the 1920s-1950s, these being a mix of frame and concrete block construction. Of particular interest is a 70’ x 74’ block erected on heavy concrete mushroom columns and standing approximately 4’ off the ground, this necessitated by the swampy conditions of what was once the site of a millpond. The second cluster of buildings formerly associated with the Gong Bell Manufacturing Company are located on the east side of Main Street. They are centered around a one-story, 96’ x 82’ frame manufacturing building with concrete foundation, synthetic siding, two-over-two double-hung frame sash, and flat roof with exposed rafter tails. The building was erected around 1925 and expanded around 1940. The roof is dominated by sawtooth monitors and a 30’ x 40’ shipping and receiving ell is located at its northeast corner. A one-and-a-half-story, 110’ x 84’ frame warehouse building adjoins the east elevation of the ca. 1940 block. Two legal parcels (8 Walnut Avenue and 101 Main Street) totaling 3.61 acres on the south side of Walnut Avenue and east side of Main Street. Located in the Belltown Historic District. In the 19th century, East Hampton became the center of the manufacturing of bells. So many bells were made in East Hampton that the town was given the name BellTown. The first factory was constructed in 1808 by William Barton on Bevin Hill later renamed Barton Hill. During the 1800s, thirty firms were said to have built and run shops, or small factories producing bell and bell related products. The most prominent names include William Barton and the numerous Barton companies of his sons, Bevin Brothers Manufacturing Company, Starr Bros. Bell Co., The N. N. Hill Brass Co., The East Hampton Bell Co., Watrous Mfg. Co., Veazey and White, and Gong Bell.